As much as we love the quirks that come with a traditional kitchen, you’ve got to agree there is just nothing like a subtly elegant modern kitchen. Minimalist cabinetry, metallic accents and a few really striking, unique pieces added into the mix? Dreamy. So, whether you are designing a kitchen from scratch or just looking for some swoon worthy inspiration for your existing kitchen, here are some tips for creating a gorgeous contemporary-style kitchen. You'll find plenty more handy tips and tricks in our ultimate guide to planning, designing and furnishing your kitchen, too. Nothing says contemporary or minimalist quite like an all-white scheme. Simple, yet effective, this stand-out scheme makes a real design statement (as long as you can keep it tidy). If you're concerned about the space feeling a little too clinical, try working different textures into your space to break up the use of one colour. In this instance, fine grey veining throughout the white marble kitchen island is just what's required to add interest to the space. For more white kitchen design ideas, take a look at our stylish guide. If an ultra-modern, all white scheme is too much for your taste (or you can't trust yourself to keep it looking spotless) consider opting for cabinetry in an on-trend, blue-grey pastel shade, instead. Grey tones are contemporary, but with timeless appeal and have a slightly warmer, more homely feeling about them. Pair with copper accents – check out that kitchen tap – for an extra dose of contemporary style. If (like us) you can't get enough of the moody interiors trend, you'll love our dark and dramatic kitchen design ideas. Shaker style kitchens have certainly stood the test of time; making them the perfect option if you want to design a contemporary kitchen with some longevity. This classic style of cabinetry is particularly standout when designed as part of an on-trend dark and moody interiors scheme. Style with (equally stylish) white metro tiles to create some contrast and brass accents, if you're going all out. Find more modern Shaker style kitchens in our design gallery. Cabinetry with a matt-effect finish is making waves in the world of contemporary kitchen interiors (and we can see why). Effortlessly sleek and sophisticated – particularly in this grey tone – it makes the perfect addition to a state-of-the-art space. Pair with a statement mirrored splashback, which makes a stylish alternative to more traditional tiles. For more kitchen splashback ideas, take a look at our design guide. The way we use our kitchens is evolving, with a desire to create open-plan spaces designed for entertaining taking precedent. 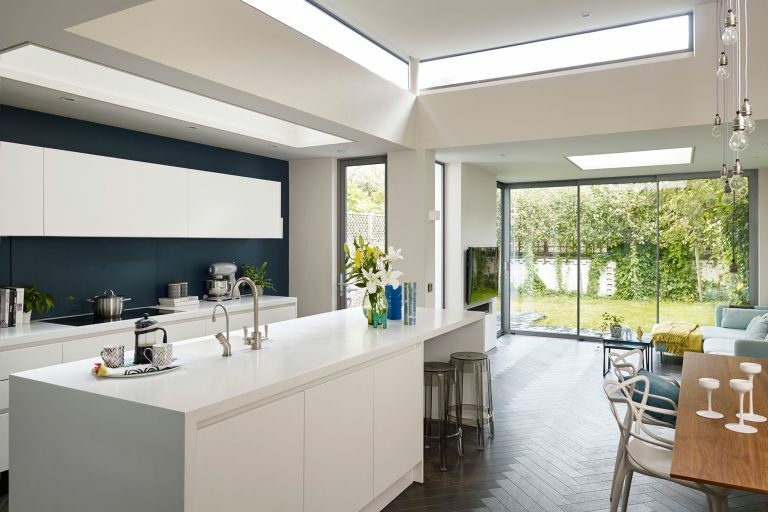 Maximising natural light is (arguably) the key to designing a contemporary kitchen that fits this new-found requirement. After all, light has the capacity to make a space feel brighter and more spacious – particularly when paired with an all-white scheme – which will make it a more pleasant place to spend time. If you're designing a kitchen extension or your kitchen opens out onto a garden, consider investing in bi-fold, sliding or metal doors (or windows), which will instantly brighten your space, while giving it a distinct contemporary edge. For more (dreamy) bi-fold and sliding door design ideas, take a look at our gallery. As mentioned, designing a contemporary kitchen is about more than the fixtures and fittings you choose (thought these are important, too). What's at the core of a contemporary kitchen is a space that can function as the hub of the home with plenty of space for engaging and entertaining. With this in mind, we love the idea of incorporating a kitchen island – complete with stylish bar stools – into your space. This provides the perfect spot for entertaining guests while you cook or catching up with a partner over a lazy weekend breakfast. Browse our clever kitchen island design ideas for more inspiration. You might enjoy our kitchen island seating ideas, too. Don't write off your dream of having a stylish, contemporary kitchen, just because you're working with a smaller space. Almost all of the tips and tricks we've shared can be incorporated into a small kitchen with a little thought and design know-how. This galley kitchen is a great example of how a small space can be used, with a stylish concrete poured floor and black, cast iron radiator making an understated design feature. For more tips on how to design a small kitchen, take a look at our guide. Industrial-inspired features make a unique addition to a contemporary kitchen and can act as a striking, yet understated, focal point if paired with an otherwise white scheme. We love this statement concrete kitchen island, particularly when paired with more natural materials such as a solid wood floor and splashback. Find more inspiration with our inspiring industrial style kitchens. Whether paired with – or without – stylish poured concrete, wood makes a warming addition to a contemporary kitchen. If you're looking to add depth to your space, consider opting for dark or red-toned woods or keep things a little lighter, brighter and more Scandi-inspired with beech and other light-coloured woods. We're not sure we'll ever be tired of Mid-century modern interiors, which makes them the perfect point of inspiration when designing a contemporary kitchen. We love the pairing of this stylish (and very Mid-century inspired) dining set with modern appliances and and otherwise sleek, minimalist interior. For more Mid-century modern decor ideas, take a look at our design guide. Looking for more kitchen design ideas and inspiration?